Our Burger Truck is just what the San Francisco Bay Area has needed. 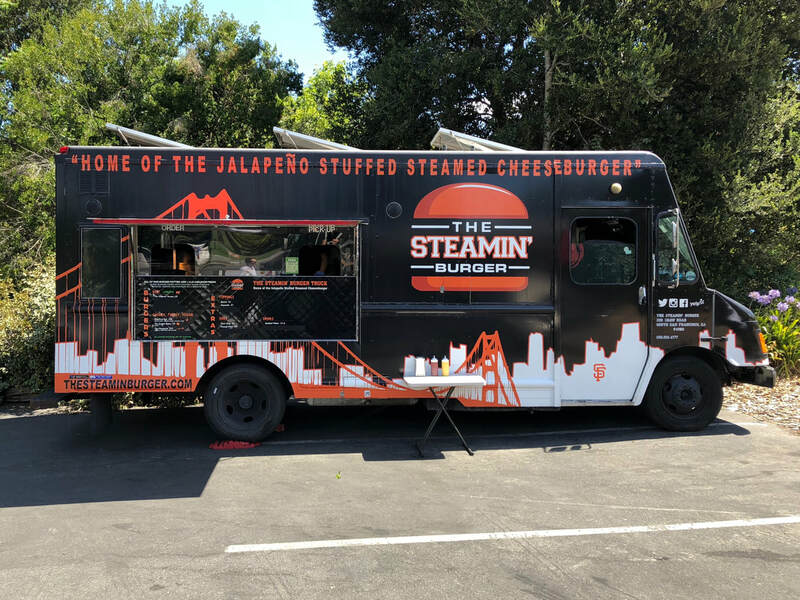 We are the 1st and ONLY Stuffed Steamed Burger Truck in the World. Our Steamed Cheeseburgers are “a healthier, tastier alternative” to regular burgers because they’re cooked with STEAM. There is no oil or grease added during cooking. Most of the grease/fat from the meat is drained out after cooking. You won't feel like you’ve eaten a greasy burger afterwards. Our burgers are served with Grass Fed ground beef, ground turkey or ground chicken covered with steamed sharp cheddar cheese on a fresh Brioche bun. The Steamin' Burger was founded by the husband and wife team of Roger and Mariana in 2013. We knew if the new company was going to be a success, it would have to be built on a strong foundation. Quality ingredients, great taste, affordable pricing and excellent service. Those values have not wavered to this day. We had our custom food truck made by BG Catering Truck Mfg. in Santa Ana, CA.